Carnaval is as carnaval does. Party Royalty collaborators Mr Worldwide and Claudia Leitte will be kicking off another mass party with eyes globally on Brazil at the official opening of the Salvador of Carnaval in February with a brand new song to get the party started – Carnaval. High energy, infectious with sampler from a traditional Argentinian song called "El Carnavalito" A mish mash of a every Latin vibe, perhaps a little ‘Zuamba’ That’s a bit of Zumba meets Samba. 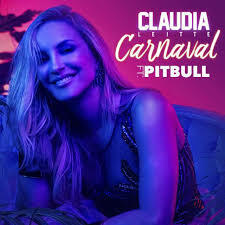 Either way there’s always something special that comes along with a collaboration between the two and if you can’t get to the carnaval then Claudia & Pitbull will bring the carnaval to you so get buying through the various options from iTunes, Amazon, Spotify, Tidal to Deezer. Making history yet again Mr Worldwide! Happy Birthday Armando! My gift to you! A Rappeom with some of your highlights of 2017 in rhymes! Listen on the audio or read ahead! Have a wonderful day. Enjoy, thank you & Dale! For he’s a jolly good fellow our Pitbull chap! Bring out the party poppers - everybody clap! Sure in your mind it first conceived! No order - just let it flow! Doin’ it for SLAM and education it’s a HUGE deal! Voli 305 Vodka the official sponsor and booze! We Are Strong - keep up on the dance floor! Given the Green Light for the Wrestle Mania 33 Song! Pit rides through Jamaica - is that a Harley? Anyone catch the moment on Pitberry? At 25,000 feet you think Pit cares about the weather? Hey Ma is it Fate of the Furious? Only listened when I met Pitbull’s rhymes – now that’s a big improvement! Pit got the jet fuelled up - ready to go! To being on stage with Tony, that Chico has come far! Gift match a scholarship that’s pretty swell! Amigo For Kids 25th Anniversary Gala Lollipop Award - that’s sweet! Learn from Armando so your business doesn't plummet! 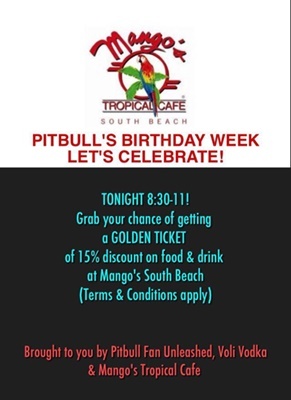 Pitbull you never cease to amaze! Old school heaven and some new - it all fits! Cos I wanna dance like Muévelo Loca Boom Boom! Milestone reached and Timber video Vevo one billion views - it’s goin’ down! Nomination for three International Reggae and World Music Awards - Boom that's done! Check your rhythm pulse something wrong there too! MORE RAP-OEMS CLICK ON THE LINKS BELOW! Far as my eyes can see Pitbull looks great in 2D! Better On Me video directed by David Rousseau features an animated Pitbull and Ty Dolla $ign taking us in their own style on a tour of the streets of Miami. Sketched on and bringing artwork and graffiti alive through the walls of Wynwood (Pitbull’s neck of the woods growing up) to the streets of Calle Ocho. While Pitbull and Ty Dolla $ign bring the video alive through 2 Dimension, The Most Bad Ones meet us in 3 Dimension as they dance through the streets adding sass to the murals behind them to stopping the traffic as they cross Calle Ocho leaving the Ball and Chain Bar behind. Caught also in action is artist Rigo Leon Herrera who makes the walls look even better with his striking colourful graffiti and murals. What I also love about The Better On me Video is that it gives a sense of meaning. The streets of Miami to the neighbourhoods where Pitbull grew up with a great feel to it.